Background and objectives Promoted globally as an evidence-based intervention in the prevention of HIV and treatment of heroin addiction among people who inject drugs (PWID), opioid substitution treatment (OST) can help control emerging HIV epidemics among PWID. With implementation in December 2014, Kenya is the third Sub-Saharan African country to have introduced OST. We combine dynamic mathematical modelling with qualitative sociological research to examine the ‘promise of methadone’ to Kenya. Methods, setting and participants We model the HIV prevention impact of OST in Nairobi, Kenya, at different levels of intervention coverage. We draw on thematic analyses of 109 qualitative interviews with PWID, and 43 with stakeholders, to chart their narratives of expectation in relation to the promise of methadone. Results The modelled impact of OST shows relatively slight reductions in HIV incidence (5–10%) and prevalence (2–4%) over 5 years at coverage levels (around 10%) anticipated in the planned roll-out of OST. However, there is a higher impact with increased coverage, with 40% coverage producing a 20% reduction in HIV incidence, even when accounting for relatively high sexual transmissions. Qualitative findings emphasise a culture of ‘rationed expectation’ in relation to access to care and a ‘poverty of drug treatment opportunity’. In this context, the promise of methadone may be narrated as a symbol of hope—both for individuals and community—in relation to addiction recovery. Conclusions Methadone offers HIV prevention potential, but there is a need to better model the effects of sexual HIV transmission in mediating the impact of OST among PWID in settings characterised by a combination of generalised and concentrated epidemics. We find that individual and community narratives of methadone as hope for recovery coexist with policy narratives positioning methadone primarily in relation to HIV prevention. Our analyses show the value of mixed methods approaches to investigating newly-introduced interventions. Using mathematical modelling, we estimate—for the first time in an African setting and in the context of a generalised HIV epidemic—the potential HIV prevention impacts of OST among people who inject drugs. Using qualitative research, we describe narratives of ‘expectation’ linked to the promise of newly introduced methadone treatment in a low-income setting. Our modelling shows reductions in HIV incidence and prevalence among people who inject drugs linked to the implementation of OST, especially at higher coverage levels. However, we note that a relatively high level of sexual transmissions in generalised epidemic settings may moderate these effects. Our qualitative research shows evidence of different, and conflicting, framings of expectation in relation to the promise of methadone, especially between methadone as a hope for addiction recovery and as a means of HIV prevention. The meanings of methadone and of new intervention technologies are negotiated locally, in context, and extend beyond the global ‘evidence-base’. We acknowledge uncertainty in how our model assesses sexual HIV transmission potential and thus also the impact projections of OST. Future models need to develop more reliable indicators of sexual transmission among people who inject drugs. Qualitative data are inevitably shaped by the contexts in which they are produced and by the settings of study, which may limit the generalisability of these findings to other settings. Methadone is promoted globally as an ‘essential medicine’ as part of ‘evidence-based’ interventions for treating heroin addiction and preventing HIV.1 Kenya is witnessing a growing contribution to national HIV incidence linked to drug injecting, with estimates of HIV prevalence among people who inject drugs (PWID) as high as 50% in Nairobi and 20% in the Coastal Province.2 ,3 Treatment for heroin addiction in Kenya largely comprises private-only short-term residential detoxification and rehabilitation, affordable to a few and characterised by high relapse.4 With international support, and following a cascade of policy development, the Kenyan Government has endorsed the incorporation of combination ‘harm reduction’ interventions.5 Needle and syringe programmes (NSP) were introduced in 2013. After 2 years of planning, methadone substitution treatment was introduced in December 2014 as a primary element of HIV prevention and drug treatment strategy. Kenya is the third Sub-Saharan African country to introduce opioid substitution treatments (OST).6 ,7 The incorporation of harm reduction, and the introduction of OST, constitutes a major departure in Kenyan drug policy, with potentially lasting effects in the management of heroin addiction and linked health harms. Just what is the ‘promise’ of methadone for Kenya? What are the hopes and expectations that surround its introduction? Combining qualitative data with mathematical modelling, we consider the ‘promise of methadone’ to Kenya. In so doing, we illustrate the value of mixed-method approaches to implementation science and to evidencing the social effects of intervention potential. The impact of methadone in HIV prevention is enhanced when delivered in combination with other harm reduction interventions, such as NSP.9 ,12 In mid (20–40%) to high (>40%) HIV prevalence epidemics among PWID, a consistently high coverage of NSP can be required to reduce HIV incidence.9 ,13 Yet introducing methadone at a coverage equivalent to that in Western Europe (around 40% of PWID) can halve the NSP coverage required to significantly reduce new HIV transmissions.14 For instance, in high (>40%) HIV prevalence settings in Russia, such as Saint Petersburg, where there is low NSP coverage and no OST, introducing OST to coverage levels equivalent to that in Western Europe could reduce HIV incidence by 50% in 5 years.14 This is an epidemiological scenario not dissimilar to Nairobi, Kenya. Initial attempts to model the effects of OST in Kenya have been based on crude data parameters and used simple static models.15 These suggest that the introduction of OST in combination with NSP at a very high coverage of each (80% of PWID) would reduce incident HIV infections of the order of 14% over 5 years. In contrast to biomedical approaches evidencing intervention promise, sociological approaches investigate intervention expectations as products of social interaction among actor networks in particular social contexts.34 In the case of methadone, an ‘actor network’ may include: medical, policy and criminal justice institutions; community, religious and media organisations; research and policy stakeholders; health service and drug treatment providers; people who use drugs and their significant others; and local affected communities and non-governmental organisations. What is in negotiation in the translation of technologies of promise extends beyond the material substance of the intervention (for instance, methadone) and its observed biomedical effects (for instance, reduced injecting) to include multiple social meanings and effects. The ‘object’ of methadone is therefore not as ‘fixed’ as biomedical evidence implies, for it is open to interpretation and re-interpretations, made locally. This is powerfully demonstrated by the variable constructions of ‘methadone’ in context and time: for example, by Russia's resistance to OST in which methadone was constructed as a ‘toxic drug’ and ‘failed intervention’ of the West;14 by the recent re-fashioning of methadone as a medicine for addiction ‘recovery’ in ‘post-AIDS’ drug policies of the UK and US which now de-emphasise ‘harm reduction’;35 ,36 and by the questioning of methadone as a treatment for opioid dependence in its early days of introduction.37 In all such cases, expectation discourses colour methadone experiences,26 with intervention ‘expectation’ being a product of its context rather than of ‘evidence’ universally accepted and applied. Evidence of the effects of implementing methadone in low-income settings is accumulating.6 ,38 The case of Kenya offers a unique opportunity to systematically study the impacts of combination harm reduction linked to concentrated HIV epidemics in a generalised epidemic context. Emerging evidence from neighbouring Tanzania, one of only two settings in Sub-Saharan Africa to implement methadone aside from Kenya, demonstrates evidence of feasibility, with high levels of uptake as well as retention, albeit with some evidence of gender inequality.38 There is a dearth of published evidence of the observed or projected HIV prevention impacts of OST in the East African region, and an absence of implementation science investigating the social processes of treatment engagement. In Kenya, national policies are reorienting towards the incorporation of harm reduction as HIV prevention, including through the endorsement of NSP, and following legal and policy change, the promise of methadone.5 NSP delivered through community service organisations is estimated to reach between 10% and 20% of PWID in Nairobi, assuming estimates between 5031 and 10 937 PWID (and perhaps 18 000 nationally).39 Drug treatment largely comprises private residential rehabilitation (hereafter ‘rehab’) offering detoxification. In the absence of state funding, this is prohibitively expensive to most, and surveys (including our own) estimate drug treatment uptake at around 10% of PWID (A Kurth, Personal communication, August 2014). Under the coordination of the National AIDS and STI Control Programme (NASCOP) and Ministry of Health, and with international funding support, methadone treatment is being implemented via specifically tailored clinics in four sites (Malindi and Mombasa in Mombasa County; Nairobi; and Kalifi). Approximately 1500 patients are envisaged in the first year, approximately 800 in Nairobi, with potential patients recruited, assessed and referred to clinics via local community outreach projects also involved in delivering NSP. We adopt an interdisciplinary mixed-method approach combining mathematical modelling with qualitative data analyses to explore the expectations of the effects of implementing methadone in Kenya as well as to project its potential HIV transmission impact. Model schematic. The main model population subgroups are shown as blue squares. The blue lines denote transitions between people who inject drugs (PWID) HIV associated infection states, black lines show which groups can infect the susceptible PWID, and light grey arrows denote PWID leaving the model due to cessation of injecting (solid grey arrows) and HIV morbidity (dashed grey arrows). The dark dashed box denotes that the non-PWID can infect either low-risk or high-risk susceptible PWID. The inflows into the system are not shown but can either enter the susceptible or latent infected class depending on the prevalence of HIV among newly initiating PWID. The model incorporates the likely degree to which HIV transmission among PWID is sexually driven. The current yearly sexual HIV incidence among PWID is estimated by calibrating a constant force of infection model to the possible HIV prevalence achieved among newly initiated PWID before they start injecting. Owing to evidence suggesting that sexual risk behaviour is a strong predictor of PWID HIV prevalence in Tanzania,40 a high HIV prevalence among new PWID in 2012 was assumed—double the 4% HIV prevalence observed among individuals of similar age (25–29 years) in Nairobi at that time.2 Different levels of sexual HIV transmission are considered in the sensitivity analysis. The injecting HIV transmission probability is calibrated to give a 20% HIV prevalence among PWID in 2014, as found in recent respondent-driven sampling (RDS) surveys in Nairobi (A Kurth, Personal communication). Data suggest that HIV prevalence in Kenya was higher in the past than it is now, and so the model assumes that new initiates to injecting and non-PWID sexual partners had a higher HIV prevalence in the past (see online supplementary figure S1).2 The modelled HIV epidemic among PWID was initiated in 199943 with an initial cohort of PWID with 15% HIV prevalence based on HIV prevalence estimates from that time.44–46 The duration of injecting was assumed to be 6 years, consistent with recent data on the duration of current injecting (4 years). Lastly, a sensitivity analysis was undertaken to consider the effect of changes in specific model parameters on the 10-year impact of scaling up to 40% coverage of OST. The sensitivity analysis considered lower efficacies of OST (lower confidence bound from the systematic review of 33%11), longer and shorter durations of injecting (4 and 8 years), higher and reduced levels of sexual HIV transmission (calibrated to a 0%, 4% or 12% HIV prevalence among new initiates to injecting in 2012), different levels of heterogeneity (none or 6 factor difference in risk instead of 3), less like-with-like mixing (0% or 25% instead of 50%) and fitting to the lower and upper bounds of the HIV prevalence in 2014 (16% or 23%, A Kurth, Personal communication). For all sensitivity analyses, except when the efficacy of OST was changed, the model was refit to available HIV epidemiological data, although some scenarios assumed a higher HIV prevalence due to sexual HIV transmission or among PWID overall. We also draw on in-depth interview data generated through qualitative longitudinal research with 109 PWID in Nairobi (n=30), Malindi on the North Coast (n=50) and Ukunda on the South Coast (n=29).4 Around a quarter (24) of these were followed up at least once. Recruitment was facilitated through introductions from community outreach projects, as well as via social network chain referral. Undertaken in the 2 years prior to methadone's implementation, interviews focused on the lived experience of HIV risk and its prevention, drug treatment and addiction recovery efforts and on perceptions of the promise of methadone. Participants had a mean age of 31 years (19–49), were predominately male (70%; 76), and all but two had injected in the past 4 weeks, with almost all (97%; 106) injecting daily. There was a mean of 7 years of injecting, with roughly a quarter (29%; 32) reporting previous experience of residential rehabilitation. A similar proportion (28%; 31) reported themselves to be HIV positive, with this being highest in Nairobi (53%; 16). In addition, 43 brief interviews were undertaken with key stakeholders in the fields of HIV prevention and drug treatment. Key stakeholders included representatives of: national policy organisations; international development organisations; drug treatment providers; HIV prevention professionals; law enforcement; and community outreach projects. Coding of qualitative data was simultaneous with data generation, enabling the research to proceed inductively over time and across sites. Following the verbatim transcription of interviews, and translation from Swahili to English where required, we ‘open coded’ for emerging content before identifying core thematic categories for subsequent coding,48 assisted by NVIVO, V.10. Preliminary findings were fed back and ‘member checked’ with participating community service organisations. We concentrate our analysis here on accounts linked to drug treatment and methadone. All interview extracts reported below (see Oboxes 1⇓⇓⇓⇓⇓–7) are among PWID unless otherwise marked as ‘stakeholders’. Interview participants received 200 KSh (US$∼2.2) as reimbursement and a food parcel. We chart the promise of methadone first, using projections generated through mathematical modelling of the potential impact on HIV transmissions, and second, using qualitative data to explore perceptions of expectation linked to methadone's implementation. Our modelling attempted to account for sexually transmitted HIV among PWID by allowing a proportion of PWID to be already HIV infected at their initiation to injecting (8%), and by assuming a continued rate of sexual HIV transmission among PWID. The level of injecting HIV transmission was then quantified by determining what additional HIV transmission is needed to fit the model to the observed HIV prevalence (20%) among PWID as found in surveys undertaken by the coauthors in 2014 (A Kurth, Personal communication). 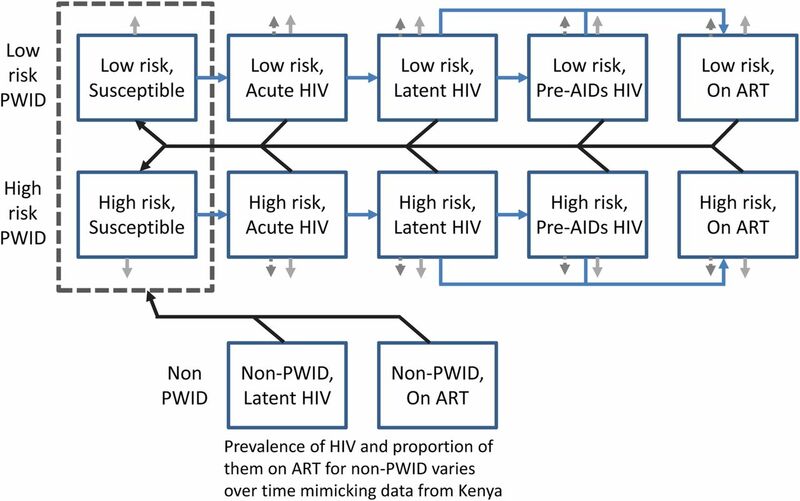 The model fit is shown in online supplementary figure S2, with the modelling scenario suggesting an HIV incidence of 3.8 per 100 person years among PWID in Nairobi with sexual HIV transmission contributing a sizeable but minority proportion (40%) of these incident HIV infections in 2014. However, up to 59% of the prevalent infections are due to sexual HIV transmission, because of substantial HIV transmission occurring before they started injecting, with the HIV prevalence among PWIDs possibly decreasing to only 12% in 2014 if no injecting HIV transmission had occurred in this population. The modelled impact of OST on HIV transmission in figure 1 shows that the current anticipated scale-up of OST over the next year (to 10% coverage) will only result in a small relative reduction in HIV incidence of about 5%, and HIV prevalence of about 2% over 5 years. The impact generally increases slowly over the subsequent 15 years. If the coverage of OST is scaled up to 20% or 40% in Nairobi, then larger decreases in HIV incidence and prevalence could occur, with a 10% or 19% reduction in HIV incidence occurring following 20% or 40% coverage of OST after 10 years, and about half that decrease being achieved on HIV prevalence, although the impact on HIV prevalence increases over time (figure 2). Projected impact of opioid substitution treatment (OST) on HIV prevalence and incidence at varied coverage levels. The results of the sensitivity analysis (see online supplementary figure S3) suggest that in general our model projections are conservative, although the estimated impact is reduced if: (1) OST has a lower efficacy for reducing HIV transmission in this setting; (2) PWID inject for longer than we currently assumed; (3) There is more sexual HIV transmission than is currently assumed; or (4) the HIV prevalence among PWID is lower than is currently estimated in recent surveys. In particular, the assumed level of sexual HIV transmission has a considerable effect on the model's impact projections. Lastly, the level of injecting risk heterogeneity and like-with-like mixing had little effect on the impact projections. The social relations of expectation regarding methadone's introduction is framed by a context of ‘poverty of drug treatment opportunity’.4 Qualitative interview accounts of PWID emphasise the salience of narratives of desire for addiction recovery despite major constraints on drug treatment access. Despite the primary focus of our qualitative research being HIV risk and its prevention, a striking feature of interview accounts is the strong emphasis they give to voicing desire for self-recovery (box 1). Here, the overcoming of heroin addiction is expressed as a ‘return to normalcy’, symbolised by reintegration into work, family and social life (box 1, extracts 4–5). As noted above, the primary form of drug treatment available is private residential rehabilitation, offering detoxification with counselling, usually over 3–6 months, at a monthly cost averaging around 10 000 KSh (US$∼114). Such treatment is prohibitively expensive for most (box 2, extract 1). In response, people invest their hope of recovery on the slim chances of securing sponsorship from local benefactors and, failing these, on their self-recovery efforts (box 2, extract 2). This is even despite the presence of strong treatment doubts given the norm of relapse following rehab, and rehab most commonly being used in practice as a ‘garage of repair’ rather than as a means of sustained ‘recovery’ (box 2, extract 3). We find that circulating narratives of recovery aspiration invest narrowly in the rehab approach, yet its lived experience is alternatively described as a form of ‘respite’ and ‘harm reduction’ from day-to-day drug use and surrounding risk environment, with any recovery effects short-lived and easily undone (box 2, extract 4). Nonetheless, hopes of addiction recovery desire may persist despite such poverty of recovery opportunity (box 1, extract 6; box 2, extract 5). We also find that an intensifying sense of time running out, especially in the light of the urgency of HIV complications or transmission risks, acts a spur to maintaining recovery desire and to pursuing alternative recovery strategies, largely through self-treatment, when rehab opportunities fail to materialise (box 2, extract 6). Methadone therefore enters an addiction treatment context characterised by a cultural script of recovery desire coexisting with rationed expectations of recovery opportunity. In this context, methadone holds much promise. With around 1500 treatment slots initially planned across four sites, methadone's implementation is ‘cautiously’ managed (box 3, extract 1). However, with rapid scale-up envisaged, stakeholder accounts highlight methadone's implementation as a project of aspiration in relation to hopes of addiction recovery (box 3, extracts 2–4) as well as HIV prevention and care (box 3, extracts 5–6). A core feature of interview narratives of methadone promise is that such treatment is posited as a solution to the problem of addiction recovery. Given the norm of relapse linked with rehab, methadone engenders hope as a better recovery alternative (box 4, extracts 1). Rehab is presented as failing to prevent relapse through its incapacity to stave off withdrawals, whereas methadone promises sustained recovery through its management of opiate withdrawals (box 4, extract 2). An emerging narrative envisions recovery made ‘easier’ by methadone (box 4, extract 3–4). Moreover, with addiction recovery envisaged as a return to normalcy and social inclusion realised through reintegration into work, family and social life (box 1), methadone is positioned as a technology of hope for enabling ‘recovery of citizenship’ where rehab has failed on delivering such promise (box 4, extract 5). Methadone as a hope for recovery is not only a feature of the personal accounts of drug users, but is incorporated into broader narratives of community hope and acceptance. Community members envisage methadone as a solution to local problems of addiction (box 5, extract 1). A key attraction here is the promise of crime reduction (box 5, extract 2). Talk of the promise of recovery potential ratchets upward expectation, and community responses to the proposal to implement methadone, which stand in sharp contrast to those of syringe exchange, are generally framed by eager acceptance (box 5, extract 3–4). This is especially the case given the circulating narratives of disappointment regarding rehab's recovery potential (box 5, extract 5), and a cultural tendency—according to some—for ‘quick fixes’ to community problems (box 5, extracts 6–7). A key contextual factor shaping the production of methadone hope locally is a norm of rationed expectation surrounding access to drug treatment (box 2). With only slim chances of access to rehab largely generated through philanthropic sponsorship (box 2, extract 2), and with communication between users and community projects concerning access to rehab characterised by ambiguity, a culture of ‘rationed expectation’ rather than ‘concrete hope’ or ‘entitlement’ to treatment prevails.4 This means that methadone offers renewed hope but in a cultural context of ‘hope moderation’, managed through the rationing of expectations borne out of the experience and disappointment of previous unrealised treatment promises (box 6, extract 1–2). Accounts emphasise that methadone's implementation has been characterised by 2 years of waiting, in the absence of certainty and in the presence of repeated revisions to promised delivery dates and organisational arrangements (box 6, extracts 3–4). The ambiguity surrounding methadone's implementation reproduces a sense of fragile expectation (box 6, extract 5). For some, methadone is already depicted as a symbol of ‘dashed hope’, representing a familiar tension between narratives of aspiration and talk of recovery desire on the one hand, and experience of unrealised promise, disappointment and limited recovery opportunity on the other (box 6, extract 6). With methadone's ‘implementation’ constituting an uncertain waiting, there is the risk of help-seeking disengagement among would-be patients (box 6, extract 6). Many others have yet to invest hope in the promise of methadone for they remain uncertain of its impact potential (box 6, extracts 7–8). Qualitative accounts of health professionals emphasise additional factors critical to determining the process of methadone's implementation and to managing its communication of ‘promise’ (box 7). Qualifying methadone's delivery as a route to ‘recovery’, as ‘maintenance’ or as ‘harm reduction’ is fundamental, especially in the light of community recovery expectations (box 5) and concerns that methadone may simply act to ‘substitute’ one drug for another (box 7, extracts 1–2). The ‘cautious’ introduction of methadone (box 3, extract 1) implies for some national policy stakeholders a ‘high threshold’ approach to eligibility, concentrating on those presumed to offer the best chances of adherence, with an emphasis on demonstrating avoidance of illicit use, commitment towards abstinence and a risk of withdrawal from the programme if random urine tests show evidence of illicit drug use (box 7, extract 3). Others hope for lower threshold access (box 7, extract 4). Managing demand is an immediate concern given the high hopes, the long waiting and the first real opportunity for users in Kenya to access drug treatment without a fee (box 7, extracts 5–7). Diversion, corruption and security are also concerns (box 7, extracts 8). Initially, methadone's implementation is constituted by stakeholders as a problem of management primarily in relation to its representation, so as to moderate community expectation and acceptance. What is said about methadone determines what it ‘is’, and thus how it is negotiated into perceived acceptance, especially in the period immediately prior to its introduction (box 7, extract 9). Alongside its cautious introduction as an intervention unchallenging of circulating hopes of recovery, implementing methadone as a ‘managed secret’ to avoid generating community resistance is one adopted strategy (box 7, extract 10), as used when implementing syringe exchange a year earlier (box 7, extract 11). Using a mix of mathematical modelling and qualitative interview data, we have projected the potential impacts on HIV transmission as well as outlined the dynamics of community expectation in relation to the promise of implementing methadone in Kenya. We recognise that these are preliminary observations. Our aim has been to demonstrate the value of mixed-method approaches to evidencing methadone's implementation in new settings and to begin charting the effects of such intervention promise. What is the potential HIV prevention impact of methadone in Kenya? Our analyses are the first to present a dynamic HIV transmission model to assess the potential impact of OST in HIV epidemics in an African setting with high levels of sexual HIV transmission. Despite the possibility of substantial sexual HIV transmission, our modelling suggests that methadone could be an important component of any intervention package aiming to reduce HIV transmission among PWID in Kenya. The high coverage levels of OST (40%) could rapidly reduce HIV incidence by 20% over 5 years, which would then slowly reduce HIV prevalence by 10% or more over 20 years. Although these demonstrable impacts are epidemiologically important, they also emphasise that OST on its own will be insufficient for controlling HIV within this population, with combined interventions including NSP, ART as well as ongoing sexual risk reduction most likely being needed. What is the making of methadone in Kenya? Our qualitative analyses emphasise how intervention expectation is a product of its social context. We find that a social condition characterised by a ‘poverty of drug treatment opportunity’ and a culture of ‘rationed expectation’ in relation to access to care frame perspectives of hope and expectation related to the promise of methadone. The combination of the salience of the addiction recovery narrative and the norm of the limited recovery effect linked to current drug treatment options heightens hope for recovery through methadone. The strong desire for recovery is envisaged as a return to normalcy, symbolised by a renewal of citizenship and social inclusion, which rehab has largely failed to deliver, despite its narrative of recovery promise. Methadone offers an alternative technology of recovery hope, not only for individuals but also for community, and hence the apparent social acceptability of methadone's proposed implementation. When communicated intervention aspirations are disrupted or unfounded, treatment and health expectations may be rationed, as well as hopes dashed, in turn feeding treatment doubt as well as disengagement, and even resistance, in response to the sense of false promise experienced.32 What might be the personal and community effects if methadone's implementation results in a sense of false recovery promise, no matter its HIV prevention potential? What might be the effects if demand management results in a sense of inequity among those who also believe themselves to be deserving of treatment opportunity? In situations of insecure HIV or drug treatment delivery, it is people in need of treatment and their treatment providers who tend to navigate the psychological effects of the fallout between high hopes and rationed expectations.32 This cautions against the generation of a rhetoric of aspiration when promoting interventions in new settings as well as when projecting their potential. The emergent primary framing of methadone in relation to addiction recovery rather than HIV prevention in this setting suggests a different mediation of methadone to that promoted globally in HIV prevention oriented policy.1 ,9 We see emerging evidence of a collision of framings in what constitutes ‘methadone’ between potential users and affected community members on the one hand, and providers, policymakers and international policy advisors on the other. Of this, stakeholders are aware (and their accounts emphasise methadone as a ‘communication problem’ to be managed), but it nonetheless emphasises that methadone is a negotiation, something in the making, rather than secured as a ‘universal given’ by its ‘evidence-base’. This collision of framings in relation to expectation of effects also speaks to the different kinds of data generated in mixed-method implementation science, for instance, between the data we have generated through modelling (oriented to HIV prevention impact) and that which we have generated through qualitative interviews (which have captured participant perspectives on recovery). Modelling methadone's potential as an HIV prevention solution tends to reproduce predominant policy framings, whereas qualitative analyses may question these, proffering alternative framings grounded in local practices. Both are needed as part of the dialogue investigating the promise of methadone. Prior to implementation, the ‘promise’ of new technologies shapes the present through what is said rather than through what is carried out.30 ,31 Intervention promise does not transcend social contexts universally but is variously made and deployed, in context, according to what it is represented to ‘mean’ and how it is ‘used’ as a resource in the negotiation of competing stakeholder interests and values. It would be a considerable oversight not to develop a social science of methadone's implementation in Kenya and the East Africa region. Fundamental questions frame its delivery and definition, including ambiguity concerning its role in addiction recovery relative to harm reduction, how demand is to be managed, as well as concerns in relation to diversion, corruption, security, provider training and capacity, medication adherence barriers and facilitators, and community support versus resistance. There is a surprising absence of implementation social science exploring the social relations of methadone interventions, especially in lower income settings, despite a robust evidence-base in relation to health effectiveness. The extreme case of Russia and its vociferous resistance to OST despite strong evidence-based counter advocacy in the face of uncontrolled HIV epidemics among PWID presents a strong retrospective case for exploring the social science of intervention expectation and engagement.14 In the case of Kenya, the time is now, as expectations in relation to the promise of methadone are formed. As well as determining the impact through evaluation and modelling, we highlight the need to capture how intervention expectation is shaped over time through the reciprocal relations between what is said (for instance, in relation to recovery hope) and what is experienced (for instance, in relation to recovery effect). Understanding the promise of methadone requires an appreciation of how this object of intervention is ‘made’ through its representations locally and, in this process, how global ‘evidence’ about it is negotiated and used. This form of implementation science is critical to properly describing how new interventions and their uptake are ‘enabled’ or ‘disabled’ by their policy and social environments. In turn, this helps build social interventions as a means of moderating aspiration and fostering ‘realistic local expectation’. There is a neglected role for ethnography and qualitative methods in implementation science, which crucially does not presume the attributes and effects of methadone to be fixed, essential or free of context, but rather consider these to be ‘something in the making’. A social science of intervention expectation broadens questions of implementation science from ‘how can interventions of evidenced-based effect be best translated into new settings?’ to ‘how are new interventions and expectations made and evidenced locally?’. Both questions are needed, but the latter is rarely applied. The authors are grateful for support from the International AIDS Alliance, and to the participating outreach projects who assisted with our fieldwork (Omari Project, Malindi; Nairobi Outreach Services Eastlands Team, Nairobi; TeensWatch, Ukunda). The authors especially thank our interview participants. The authors would like to acknowledge our partnerships with the Kenyan National AIDS Control Council, National AIDS and Sexually Transmitted Infections Programme (NASCOP) and Kenyan AIDS Non-Government Organisations Consortium (KANCO), and with the following individuals: Sylvia Ayon (KANCO); George Githuka (NASCOP); Sobbie Malindi (NACC); Reychard Abdool (UNODC); and Saade Abdalla (UNDOC). AK and CC are supported through R01 DA032080, and SAS through NIDA R37 DA019829. PV is supported by the Bill and Melinda Gates Modelling Consortium. United Nations General Assembly Sixtieth Special Session. Political Declaration on HIV/AIDS. Resolution 60/262 adopted by the United Nations General Assembly, New York: United Nations, 2006. National AIDS and STI Control Programme (NASCOP). Kenya AIDS Indicator Survey 2012. Nairobi: Republic of Kenya Ministry of Health, 2014. National AIDS Control Council (NACC) and National AIDS and STI Control Programme (NASCOP). Kenya AIDS Epidemic Update 2011. Nairobi: Republic of Kenya Ministry of Health, 2012.
. Hope and recovery narratives in the treatment of addiction: navigating the poverty of drug treatment opportunity in Kenya. Global Public Health 2015 (in press). National AIDS and STI Control Programme (NASCOP). Kenya National Guidelines for the Comprehensive Management of the Health Risks and Consequences of Drug Use. Nairobi: Ministry of Health, 2013.
. What intervention combinations and coverage are needed to control HIV among people who inject drugs in Russia, Estonia and Tajikistan? Insights from model projections. Int J Drug Policy 2014;25:1163–73.
. Substance and substitution: methadone subjects in liberal societies. London: Palgrave, 2008.
. The body multiple: ontology in medical practice. Durham: Duke University Press, 2003.
. The drug addict as a patient. New York: Grune and Stratton, 1956.
. Methadone treatment for HIV prevention: feasibility, retention, and predictors of attrition in Dar es Salaam, Tanzania. Clin Infect Dis 2014;59:735–42. National AIDS Control Council of Kenya (2012). Kenya AIDS Epidemic Update. 2011. National AIDS and STI Control Programme (NASCOP) (2014). Kenya AIDS Indicator Survey 2012: Final Report. Nairobi, Kenya. National AIDS Control Council of Kenya (2014). Kenya AIDS Response Progress Report 2014: Progress to Zero.
. Constructing grounded theory. London: Sage, 2006.
. Survival and cessation in injecting drug users: prospective observational study of outcomes and effect of opiate substitution treatment. BMJ 2012;340:c3172.
. The Republic of therapy. London: Duke University Press, 2010. Contributors TR conceived the study, undertook data collection and took primary responsibility for data analyses and write-up. AG and JN undertook data generation and assisted in data coding. CC, AK and LP contributed epidemiological data, including to inform modelling parameters. PV designed and undertook mathematical modelling and its write-up. EN and SS provided overall academic guidance. All authors contributed to the writing and preparation of this manuscript. Funding This research was funded by the International AIDS Alliance. AK and CC are supported through NIDA R01 DA032080, and SAS through NIDA R37 DA019829. PV is supported by the Bill and Melinda Gates Modelling Consortium. Ethics approval University of Nairobi Kenyatta National Hospital and London School of Hygiene and Tropical Medicine Research Ethics Committee. Data sharing statement These qualitative data are drawn from a larger body of qualitative data which focuses on HIV risk and prevention among people who inject drugs and which, while currently unpublished, will form the basis for future analyses as a basis for future publications.